I'm finally ready to begin teaching The Church of Jesus Christ. I'm going to be using my lesson plan and visuals from several years ago found HERE which is a simple treasure hunt. Before primary, hide all the treasure hunt items as indicated in the link above. 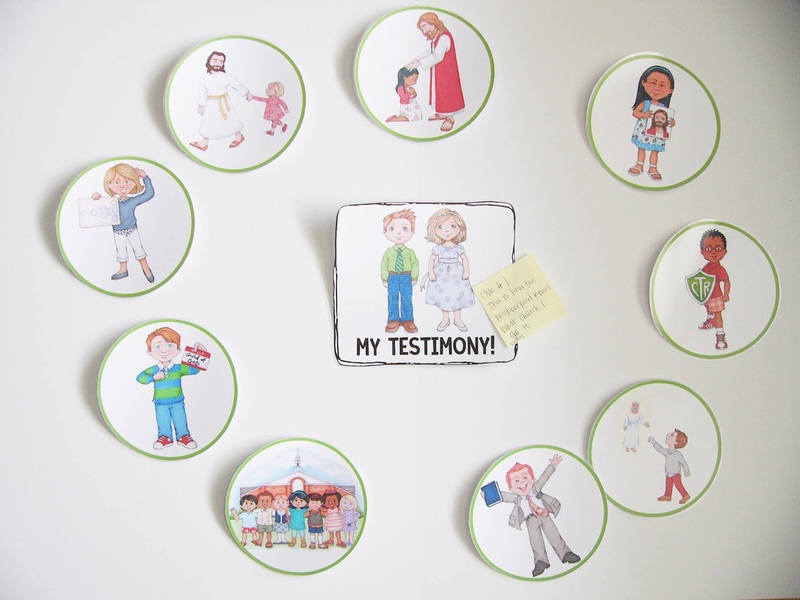 Also, hang on the chalkboard the "My Testimony" page, along with all the flip chart pictures from Susan Fitch found HERE around it. I cut out the green circles (omitting all the words) and laminated them. "Ask the children to stand if they belong to a family. Repeat for other groups they might belong to, such as a team, a club, and a church. Let the children explain what belonging means (that you are an important part of something). Introduce the song by showing a picture of Jesus Christ and having the children read together Doctrine and Covenants 115:4." Then to introduce each phrase of the song (as is also suggested in the outline) I will incorporate the treasure hunt. Once each clue/phrase is found throughout the building (or primary room if that works better for your primary), the clue will be placed over the picture it corresponds to. 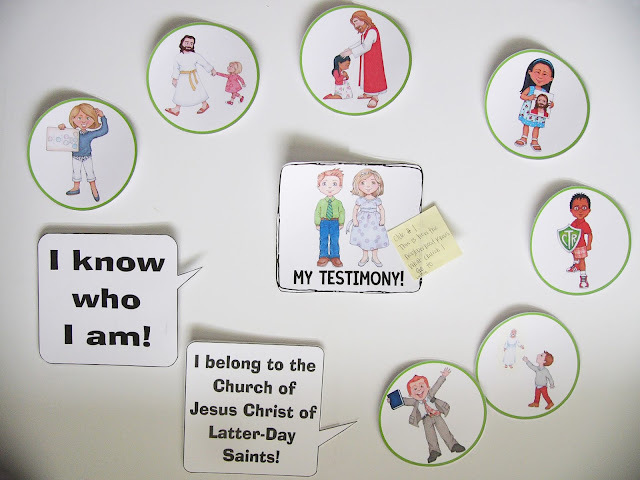 So the first clue/phrase "I belong to the church of Jesus Christ," will be placed over the first picture of all the kids standing outside the church building (see the first picture posted above). Then we'll sing that line and hum to the end of the song. We'll repeat, adding additional phrases as they are found and humming to the end of the song, gradually singing the entire song. You can find my quick reference guide HERE so you know where to place everything and the simple activity. Anyway, in January, I purchased Janice Kapp Perry's Beloved Double Melodies CD (find it HERE) which contains the song The Church of Jesus Christ. Included with the CD is a PDF songbook.